Kiriki Embroidery kit: includes screen printed design, DMC floss and link to PDF instructions. Learn a Variety of embroidery stitches with this sampler and have a handy reference guide for your stitches when you are finished. These cute little embroidery kits are made in independently created in Canada by Kiriki designs. 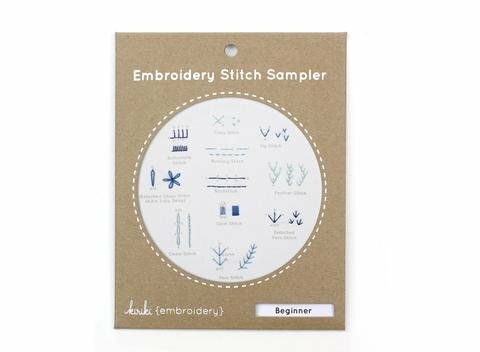 Each kit comes with a screen printed sampler design, DMC embroidery floss and a link to PDF instructions for your project. a 6 inch embroidery hoop. These cute little kits come in two learning levels: Beginner and intermediate plus 4 seasons (fall, winter, spring, summer).